Everyone needs to have one. And, I really do mean everyone. It’s important to have goals in life, and to experience new things to truly live exhilaratingly. They don’t have to be anything outrageous or crazy out of your comfort zone, but they should be a little daring. They should expand your metaphorical box, inspire your creativity, excite you, and make you feel absolutely wonderful. These experiences are what makes up the memories in your life. They are the highlights of your mind, and the fond little anecdotes you will tell your grandkids. Now, that is not to say grandparents should not have a bucket list. It is never too late to start. 2. 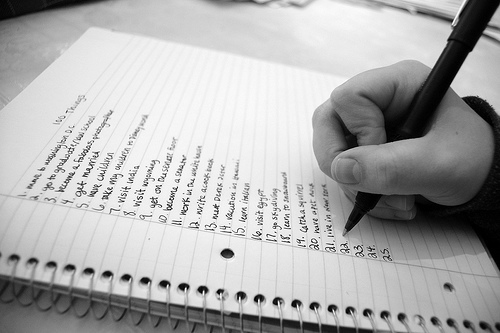 Write down big activities you have always wanted to do. Some examples would be backpacking around Europe, traveling to Paris, learning Spanish, travel the world in 180 days…. 3. Write down the smaller, weekly do-ables you’ve always wanted to experience. They can range from paintballing, trying that new donut shop that opened down the street, make reservations at that trendy restaurant you’ve always wanted to go to, and planning a short impromptu camping trip with friends. The beauty of the bucket list is that it is always able to change. There is no set format, no set order, no permanence to it. It is just your little world to jot down ideas, throw in some ideas for fun experiences, and to enjoy life. It is also an excuse to try that one daring thing you have never tried before, but have always secretly wanted to. The items on the bucket list can also be goals to reach themselves, or even rewards. Things on the bucket list can easily be removed, many things can be added as you discover them. Life is continually changing. Tastes change, dreams change, and activities can change too.They can also be done over the span of a lifetime, or during that summer before you leave for college. There are no limits, no absolutions, no regulations. Spice up your life, keep track of the things you’re interested in, and enjoy life (as cliche as it is), to the fullest! This entry was posted in Re:Framed, Uncategorized and tagged afraid, Bucket, bucket list, change, cliff diving, college, desire, discover, dream, hope, ideas, life, lifetime, List, order, paintball, shop, sky diving, want, wish. Bookmark the permalink.